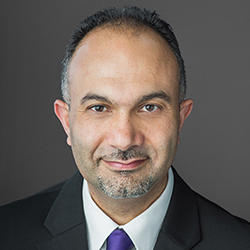 Prof. Farha’s research seeks to solve exciting problems in chemistry and materials science ranging from energy and environment related applications to challenges in national defense by employing atomically precise functional materials. By exploiting the modular nature of metal–organic frameworks (MOFs) and porous organic polymers (POPs), we work to fundamentally understand the role of three-dimensional architecture in modifying a material’s function for applications in gas storage and separation, catalysis, water remediation and detoxification of chemical warfare agent simulants. “Bottom-up construction of a superstructure in a porous uranium-organic crystal” P. Li, N. A. Vermeulen, C. D. Malliakas, D. A. Gómez-Gualdrón, A. J. Howarth, B. L. Mehdi, A. Dohnalkova, N. D. Browning, M. O’Keeffe, O. K. Farha, Science, 2017, 356, 624-627. “Cerium(IV) vs zirconium(IV) based metal–organic frameworks for detoxification of a nerve agent” T. Islamoglu, A. Atilgan, S.-Y. Moon, G. W. Peterson, J. B. DeCoste, M. Hall, J. T. Hupp, O. K. Farha, Chem. Mater.,2017, 29, 2672-2675. “Metal–organic framework supported cobalt catalysts for the oxidative dehydrogenation of propane at low temperature” Z. Li, A. W. Peters, V. Bernales, M. A. Ortuño, N. M. Schweitzer, M. R. DeStefano, L. C. Gallington, A. E. Platero-Prats, K. W. Chapman, C. J. Cramer, L. Gagliardi, J. T. Hupp, O. K. Farha, 2017, ACS Cent. Sci., 3, 31-38. “Postsynthetic tuning of metal–organic frameworks for targeted applications” T. Islamoglu, S. Goswami, Z. Li, A. J. Howarth, O. K. Farha, J. T. Hupp, Acc. Chem. Res., 2017, 50, 805-813. “Best practices for the synthesis, Activation, and characterization of metal–organic frameworks” A. J. Howarth, A. W. Peters, N. A. Vermeulen, T. C. Wang, J. T. Hupp, O. K. Farha, Chem. Mater., 2017, 29, 26-39. “Chemical, thermal and mechanical stabilities of metal–organic frameworks” A. J. Howarth, Y. Liu, P. Li, Z. Li, T. C. Wang, J. T. Hupp, O. K. Farha, Nat. Rev. Mater., 2016, 1, 15018. “Framework-topology-dependent catalytic activity of zirconium-based (porphinato)zinc(II) MOFs” P. Deria, D. A. Gómez-Gualdrón, I. Hod, R. Q. Snurr, J. T. Hupp, O. K. Farha, J. Am. Chem. Soc., 2016, 138, 14449-14457. “Encapsulation of a nerve agent detoxifying enzyme by a mesoporous zirconium metal–organic framework engenders thermal and long-term stability” P. Li, S.-Y. Moon, M. A. Guelta, S. P. Harvey, J. T. Hupp, O. K. Farha, J. Am. Chem. Soc., 2016, 138, 8052-8055. “Toward design rules for enzyme immobilization in hierarchical mesoporous metal-organic frameworks” P. Li, J. A. Modica, A. J. Howarth, E. Vargas, P. Z. Moghadam, R. Q. Snurr, M. Mrksich, J. T. Hupp, O. K. Farha, Chem, 2016, 1, 154-169. “Destruction of chemical warfare agents using metal–organic frameworks” J. E. Mondloch, M. J. Katz, W. C. Isley III, P. Ghosh, P. Liao, W. Bury, G. W. Wagner, M. G. Hall, J. B. DeCoste, G. W. Peterson, R. Q. Snurr, C. J. Cramer, J. T. Hupp, O. K. Farha, Nat. Mater., 2015, 14, 512-516. “Selective photooxidation of a mustard‐gas simulant catalyzed by a porphyrinic metal–organic framework” Y. Liu, A. J. Howarth, J. T. Hupp, O. K. Farha, Angew. Chem. Int. Ed., 2015, 54, 9001-9005. “Ultraporous, water stable, and breathing zirconium-based metal–organic frameworks with ftw topology” P. Deria, D. A. Gómez-Gualdrón, W. Bury, H. T. Schaef, T. C. Wang, P. K. Thallapally, A. A. Sarjeant, R. Q. Snurr, J. T. Hupp, O. K. Farha, J. Am. Chem. Soc., 2015, 137, 13183–13190. “Dual-function metal–organic framework as a versatile catalyst for detoxifying chemical warfare agent simulants” Y. Liu, S.-Y. Moon, J. T. Hupp, O. K. Farha, ACS Nano, 2015, 9, 12358-12364. “Ultrahigh surface area zirconium MOFs and insights into the applicability of the BET theory” T. C. Wang, W. Bury, D. A. Gómez-Gualdrón, N. A. Vermeulen, J. E. Mondloch, P. Deria, K. Zhang, P. Z. Moghadam, A. A. Sarjeant, R. Q. Snurr, J. F. Fraser, H. T. Hupp, O. K. Farha, J. Am. Chem. Soc. 2015, 137, 3585–3591. “High efficiency adsorption and removal of selenate and selenite from water using metal–organic frameworks” A. J. Howarth, M. J. Katz, T. C. Wang, A. E. Platero-Prats, K. W. Chapman, J. T. Hupp, O. K. Farha, J. Am. Chem. Soc., 2015, 137, 7488–7494. “Instantaneous hydrolysis of nerve-agent simulants with a six-connected zirconium-based metal–organic framework” S-Y. Moon, Y. Liu, J. T. Hupp, O. K. Farha, Angew. Chem. Int. Ed., 2015, 54, 6795-6799. “Solvent-assisted linker exchange: an alternative to the de novo synthesis of unattainable metal–organic frameworks” O. Karagiaridi, W. Bury, J. E. Mondloch, J. T. Hupp, O. K. Farha, Angew. Chem. Int. Ed., 2014, 53, 4530-4540. “Beyond post-synthesis modification: evolution of metal–organic frameworks via building block replacement” P. Deria, J. E. Mondloch, O. Karagiaridi, W. Bury, J. T. Hupp, O. K. Farha, Chem. Soc. Rev., 2014, 43, 5896-5912. “Perfluoroalkane functionalization of NU-1000 via solvent-assisted ligand incorporation: synthesis and CO2adsorption studies.” P. Deria, J. E. Mondloch, E. Tylianakis, P. Ghosh, W. Bury, R. Q. Snurr, J. T. Hupp, O. K. Farha, J. Am. Chem. Soc., 2013, 135, 16801-16804. “Metal–organic framework materials with ultrahigh surface areas: is the sky the limit?” O.K. Farha, I. Eryazici, N.C. Jeong, B.G. Hauser, C.E. Wilmer, A.A. Sarjeant, R. Q Snurr, S.T. Nguyen, A. O. Yazaydin, J. T Hupp, J. Am. Chem. Soc., 2012, 134, 15016-15021. “Rational design, synthesis, purification, and activation of metal−organic framework materials” O. K. Farha, J. T. Hupp, Acc. Chem. Res., 2010, 43, 1166–1175. “Metal–organic framework materials as catalysts” J. Y. Lee, O. K. Farha, J. Roberts, K. A. Scheidt, S. T. Nguyen, J. T. Hupp, Chem. Soc. Rev., 2009, 38, 1450-1459.